You may know how it is easy for you to download streaming music online, but do you know that you can record your own sound on computer? How about recording your very own song? Thanks to the development of the recording technology nowadays, you can get high-quality recorded music files. Therefore, This post will introduce how to record audio from your computer, and you could follow the steps below to finish the task. To record audio on computer, you could use the Windows built-in voice-recording software called Sound Recorder. To use this feature, the computer that’ll be used for recording must have a sound card, or an audio card and speakers installed; otherwise, there’s no way to facilitate the use of audio components. The audio can be played back using a media player program, such as Windows Media Player. 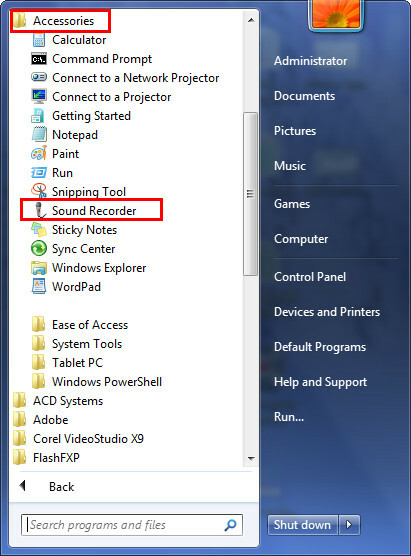 Now, the steps below will show you how to record audio from your computer with Sound Recorder. 1. Click the Start button, and then type Sound Recorder in the search box. From the list of results, select Sound Recorder. If a version of Windows is being used that precedes Windows 7, then after clicking Start, click All Programs, and then point to Accessories and select Entertainment, then click Sound Recorder. 2. Click Start Recording to begin the recording session. 3. When satisfied with what’s been recorded, click Stop Recording to end the session. 4. To save the audio file, click the File Name box, assign the session a name, and then click Save. Leawo Music Recorder is a top-rated audio recording software program that could record any audio available, including Built-in audio (Built-in Microphone, Built-in Input and Greatdy System Audio) and Computer Audio (Computer Audio Stream and Online Music). It has a free trial version, which means Leawo Music Recorder could be a free audio recorder. This best free audio recorder software could record audio into MP3 and WAV formats. No matter you’re going to record built-in input audio or online audio from online music sites and radios like YouTube, Pandora, Last.FM, Napster, Spotify, GUBA, NPC, MySpace, etc., Leawo Music Recorder could easily help you achieve the task. What’s more, it could automatically download and add song tags to recordings, including song artist, song album, album artwork, song name, etc. After downloading and installing Leawo Music Recorder or Leawo Music Recorder for Mac on your PC or Mac, launch it to enter the main interface of the program to record streaming audio free. The following tutorial guide takes Leawo Music Recorder as an example to show you how to record audio on computer. Before you start to record audio on Mac or PC, you need to figure out what kind of audio source to record. Click “Audio Source” icon on the bottom-left corner to invoke the Audio Source settings panel. If you want to record computer stream audio or online music, you need to select “Record Computer Audio”. If your source audio is external audio of your computer, you need to select “Record Audio Input” option. Then, click the red start button on the program interface to get ready for recording process. After you click the red button, you should start to play source audio. It should be noted that the audio source shall be played after the red button is clicked, otherwise the audio source might be not recorded completely. After recording, this music recording software could automatically download and add music tags such as Title, Artist, Album, Album Artwork, Year, Genre, etc. If you’re not satisied with the results, or the program failed to add song details, you could edit the song tags manually by right-clicking the desired recording and selecting “Edit Music Tags” option.